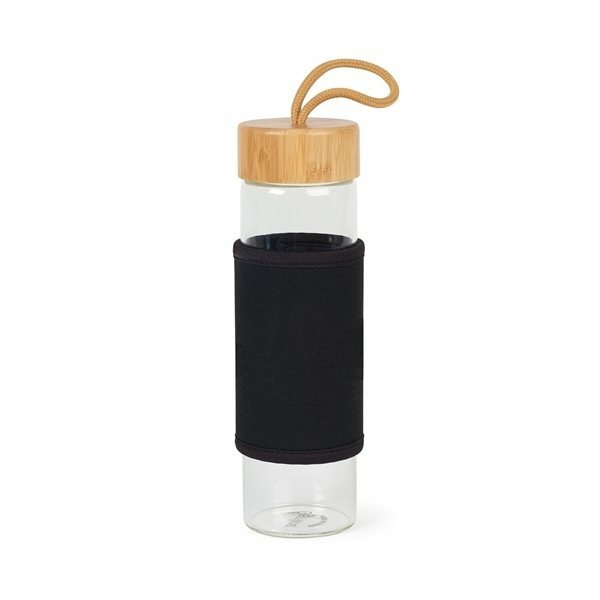 Mixed glass and bamboo materials make for a stylish drink bottle. Glass bottle provides a purer drinking experience. Extra-thick borosilicate glass is clean tasting and odor-free. Screw top lid with built-in, braided carry loop for on-the-go use. Wide-mouth opening is ideal for adding ice cubes to your drink. Canvas sleeve protects your bottle and acts as a grip when drinking. Body is dishwasher safe (top rack), hand wash lid and canvas wrap. This product contains bamboo, which is a natural material. Color and pattern variances are to be expected.